Special thanks to Derek Redmond and the CJ-3B page for the fire truck info below. Larry Zotti travelled to Frankenmuth from Granite City, Illinois where he's curator of the Granite City Fire Museum. He says, "The Jeep was delivered from Howe to The Principia College in Elsah, Illinois in 1950. The school owned it and kept it in service until April 2004 when I bought it with its matching trailer. I am in my mid-fifties and my family has always been 'Jeep.' My father owned a couple of 40's and 50's-vintage Jeep wagons back in the 60's. I have had six Willys and one AMC Jeep in the past 30 years. 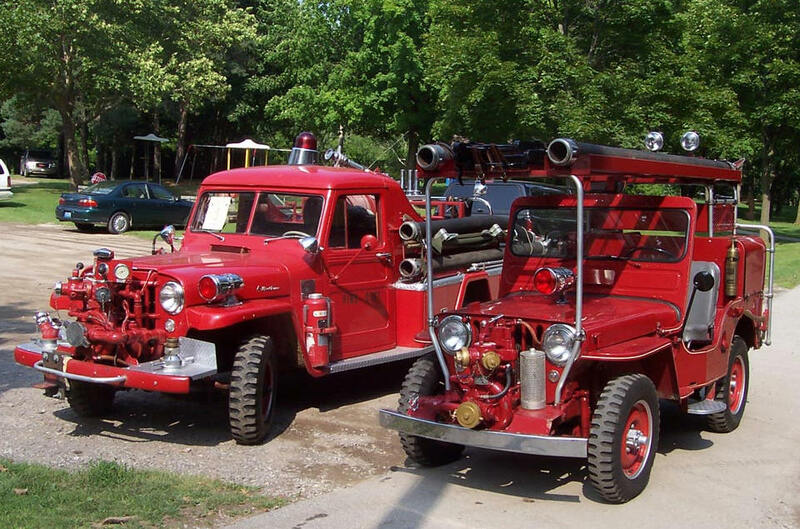 I have a real love for old fire engines and Willys Jeeps. I can't think of a better way to satisfy both." 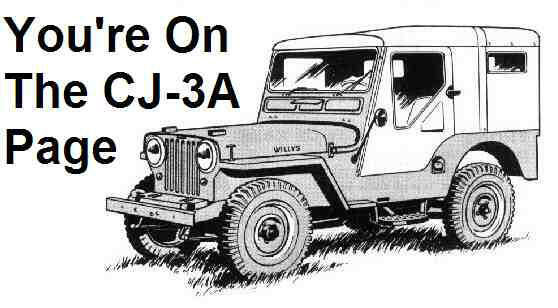 The CJ-3A carries Willys serial number 55034, and S.N. 8147 from Howe Fire Apparatus of Anderson, Indiana. Photographed by Gary Dreyer. This retired Jeep fire engine belonging to Lindsay Clark is in good condition but missing most of its original fittings and equipment. The 1950 CJ-3A, serial number 43168, was converted as a fire engine by the Boyer Fire Apparatus Co. of Logansport, Indiana. Note the Boyer-installed front bumper, with the opening for the PTO-powered pump. See a Boyer factory photo (80K JPEG) illustrating how a CJ-3A fire Jeep would have looked when new and fully equipped. According to the Boyer Fire Apparatus Production List this Jeep was originally sold to Western Electric in New York in 1950. According to Rodger Birchfield, "This unit was delivered to Western Electric's plant on Indianapolis' east side for in-plant fire protection. It was probably purchased by the company's home office through Midwest Fire & Safety of Indianapolis, then representatives for Boyer. When the plant closed, the pumper complete with trailer went to a Western Electric campground in Virginia." Surviving CJ-3A fire Jeeps are harder to find than CJ-2A's, and this one is in great shape with only 2726 miles on the odometer. Lindsay Clark ( LCLARKAUTO@aol.com) is interested in restoring the Jeep and is looking for original parts including the pump, ladders, extinguishers and accessories. See also a left front view (70K JPEG). This CJ-3A equipped as a fire engine by Howe Fire Apparatus in 1952, was purchased in early 2003 by Terry Clark, from the Kitimat Volunteer Fire Department in northern British Columbia, just south of the Alaska panhandle. The Jeep had been retired for some years, in running condition with 13,695 miles on the odometer. The original tires had been replaced, and it appears that a new front bumper was fabricated at some point, but the Jeep is largely in original condition. Terry comments, "The Go Devil L-134 engine (100K JPEG) starts without a problem. The fire hall mentioned that they had to charge the battery once in a while -- not bad for not using it that much." Terry also says, "The Jeep needs work; the floors are starting to rust out, it needs a new paint job, and the pump has a hole in the bottom of it. My plans are to restore to original." The Jeep was in fact originally purchased by the Alcan aluminum plant, the main industry in Kitimat, where it would handle any minor fires. It was retired in about 1980 to the care of the KVFD. See the Willys-Overland VIN plate (40K JPEG) with serial number 452GB1 12113, and the Howe serial number plate (60K JPEG) with Howe serial number 8539. The rear platform carries a small-diameter hose reel; we're not sure whether it's original or a later addition. The taillights high on the body appear to be a modification; note the original wiring holes lower on the body. The front parking lights have been replaced with rectangular marker lights. The Barton pump, built by American-Marsh, is driven from a driveshaft connected to the crankshaft pulley. See a closer view of the Barton serial number plate (40K JPEG) showing type U40 and number C98867. Terry is quite pleased with his find, and looking forward to restoring it. He would welcome any information or advice at m38jeeper@hotmail.com.